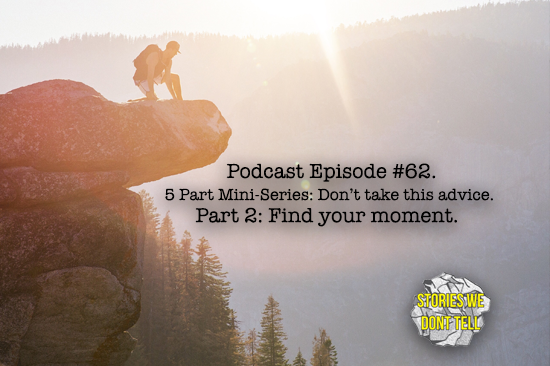 This is a transcription of Stories We Don't Tell Podcast Episode 62: Find your moment. Listen to the podcast episode HERE. We're dealing with pretty compact stories here. Usually about 7 to 10 minutes of time or a couple of pages. You write it all out and then you zero in. One of the issues with finding that moment or the reason why we suggest this is that sometimes people want to tell their entire life story leading up to that one thing that they think their story is about. All you need to do is set up the narrative properly and pick those details that are important to the story. Finding the moment doesn't necessarily have to be only the climax of the story. Creating a frame for your story itself within this longer moment is important to communicate the emotions you want the audience to feel. Something that might happen is the focus of the story might change. You write out the entire story and then there's a little piece where everyone's like, "Oh that's the story." As the storyteller and as the writer you decide how fast time moves. If you start describing the scene or space or your feelings or what's happening - the more detail you provide, the slower time feels. No one will understand and be there with you unless you really invest their time into making them feel it with you and keeping them there in that moment. To wrap up, after writing your entire story down, find the moment your story is about and slow down time in order to make the emotions come alive.